De Brazza’s monkeys live in eastern to central Africa, in countries such as Cameroon, Ethiopia, Kenya and Angola. They live in the forests along rivers. They are arboreal (meaning they live in trees), but are also active on land and have been observed swimming. De Brazza’s monkeys are very distinct looking. They are grey with black limbs and tail, with a long white beard, white muzzle and orange crown. There is a size difference between male and female De Brazza’s monkeys. The females weigh an average of 8 1/2 pounds, and the males average around 15 pounds. Body lengths range between 16 and 25 inches. The lifespan of these monkeys is unknown. However, other species of the same genus have been reported to live over 30 years in captivity. Lifespans in the wild are likely to be shorter than 30 years. De Brazza’s monkeys are omnivores, but eat mostly fruit. Other items in their diet are leaves, flowers and insects. At the Zoo, the De Brazza’s monkeys eat primate browse biscuits, fruits and vegetables. Breeding occurs more often when food is abundant. The gestation period is 5 to 6 months, and produces usually a single infant. The newborns are furred with their eyes open, and immediately cling to their mother’s fur. Female offspring often stay with their mothers their whole lives. IUCN status – least concern. Even though they aren’t endangered or threatened, Ethiopia has protections against them from being hunted and trapped. 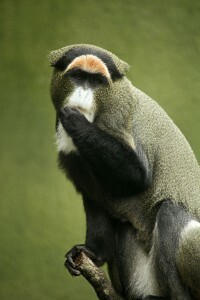 The Birmingham Zoo is actively participating in the De Brazza’s monkey Species Survival Plan (SSP). The goal for SSPs is to help animals that are in danger of extinction in the wild. With some of these animals, captive breeding programs may be their only chance to survive. For animals that aren’t so close to extinction, such as De Brazza’s monkeys, SSPs also help maintain healthy and genetically diverse animal populations within the Zoo community. The Zoo’s De Brazza’s monkeys are located in the primate building. The Zoo has four De Brazza’s monkeys. Huey is the male. He was born June 10, 2007. Brittany is the adult female, and she was born October 10, 1999. Together, they have two offspring. Poppy was born on May 26, 2014 (Memorial Day), and the new baby was born July 27, 2015. De Brazza’s monkeys usually forage in open spaces, making them vulnerable to predation. To minimize this time of vulnerability, they have cheek pouches to store extra food. When scared, De Brazza’s monkeys freeze to avoid detection from predators.